Both the iPhone and iPod touch come with a built-in notepad app, which works very simply and efficiently. You type in your note, you save it; the app notes the date and time. Onward and upward. Who could ask for anything more? YouNote answers that question with a bevy of features you may not realize you need until you use them. YouNote is Notepad injected with a super-soldier serum and exposed to dangerously high doses of gamma radiation. And this monster of an app is available for free. I didn’t expect to like YouNote as much as I do. But the app’s appeal quickly becomes apparent with use. A diversity of note-taking features and powerful note organization tools make YouNote an essential productivity app and render the old notepad obsolete. The power and appeal of YouNote is in the app’s organization and diverse note-taking functions. YouNote offers six different note types, including the standard notepad (which, by the way, is blue-and-white). YouNote also has a camera and photo feature, a drawing pad, a simple digital audio recorder, a Web search and tag function, and a “MultiNote” feature, which lets you incorporate audio, images and text into one note. As an organizer, YouNote cannot be beat. Not content with merely recording the date and time of a note, YouNote also allows for extensive tagging and color-coding. And YouNote makes use of the iPhone’s GPS feature to add locations to notes, which is especially helpful with photos. YouNote has limits, however. 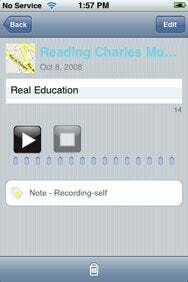 It occurred to me that YouNote’s recording feature might make my iPhone useful for recording interviews. Yes and no—it’s not a bad digital recorder. The sound quality is merely good, not great. Obviously, the amount of audio you can store depends on how much space you have available on the device. The larger the file you record, the slower YouNote gets. Also, the control buttons on the phone app are limited to play, record, stop and pause. The developers should consider adding a fast-forward and rewind feature in a future release. Giving Voice to Your Notes: YouNote’s simple digital recorder would be better served with a fast-forward and rewind button along with play, record, stop and pause. Apart from the occasional crash—and I have yet to encounter an iPhone app that doesn’t quit on a whim now and then—the one real drawback to YouNote is the difficulty of exporting notes from the app. If I could add one feature to YouNote, it would be an e-mail function. As it is now, you need embark upon a painfully slow back-up process that moves the entire contents of YouNote’s database from one device to another. If you want to transcribe a recording, for example, you need to back up your notes to a laptop or a desktop machine, unzip the backup director, and locate the sound file and open it in Real player or the player of choice. But before you do anything, you need to download the YouNote desktop application, which is available for free from Sophiacom’s Web site. The inconvenience of backing up YouNote’s files is more than offset by the power and convenience of the application’s features. Ditch the notepad and get YouNote. YouNote is compatible with any iPhone or iPod touch running the iPhone 2.x software update.